The Okinawa islands are situated far off south from central Japan and therefore quite tropical. The islands are very popular by domestic, and nowadays foreign tourists alike. Particularly, Ishigaki and the surrounding smaller islands even further in the south are very well-frequented. But since my trip is so short anyway, I will not be able to make it there this time. Instead, I decided to focus on the main island where the biggest city Naha, as well as various sightseeing related spots, are situated. After a long weekend in Tokyo I will take an early JAL flight from Haneda airport to Naha on Monday morning. Three hours later I will find myself at the small airport of the main island of Okinawa. From there it is a short ride with the local monorail to my accommodation, another Airbnb. Without spending much time there I will make my way southbound to Okinawa World by local bus. Okinawa World is a one-of-a-kind theme park. While it offers more than one attraction, my focus will be on the Gyokusendo Cave, a natural cave with a length of five kilometers of which 850 meters are accessible. When I return it will be evening already, so I plan to stroll through Kokusai Dori, the cultural center of the city to try some of the local cuisine. 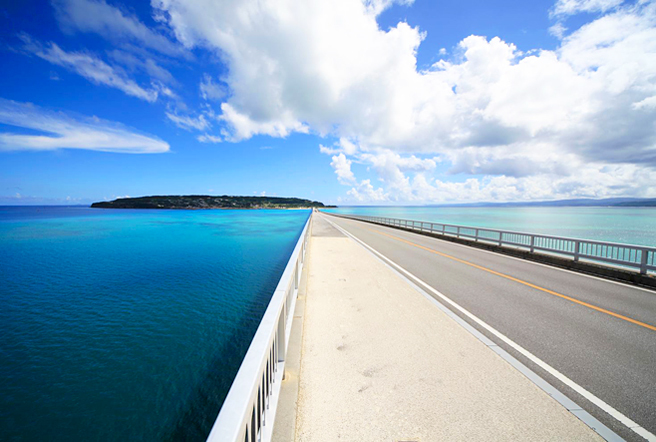 In fact, the far distance between Okinawa to the main islands of Japan has its influences. From what I have heard so far, the locals speak a very distinct dialect, the climate is much more tropical and there are also the remaining military bases of the United States, which are heavily discussed right now. For the second day I planned a full-day tour to see some of the sights outside of Naha. Since Okinawa does not have the dense and well-maintained train network of the main islands, or in fact any (after it was destroyed during WW2) one has to rely on either a rental car or public buses. The first option did not appeal to me and taking individual buses would not have allowed me to see many locations on the same day. So I was pleased to find a sightseeing tour which takes me around effortlessly by bus. 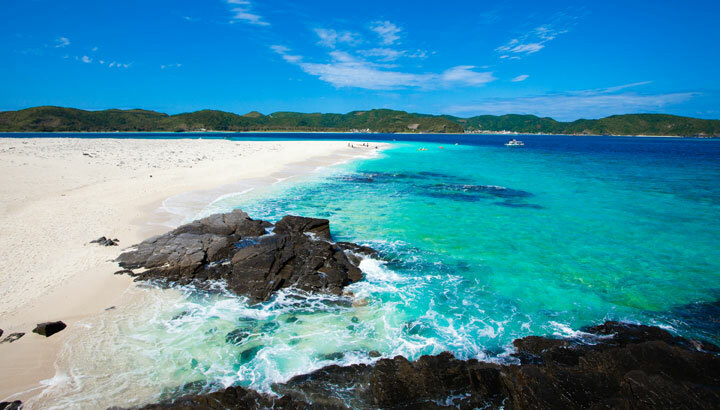 The first stop on the tour will be Kouri-jima, a small off-shore island which can be accessed by car. The scenery is so beautiful with the crystal clear water and I would love to dip my feet into the warm water. The highlight of the day will certainly be the Churaumi Aquarium in the North of the island. 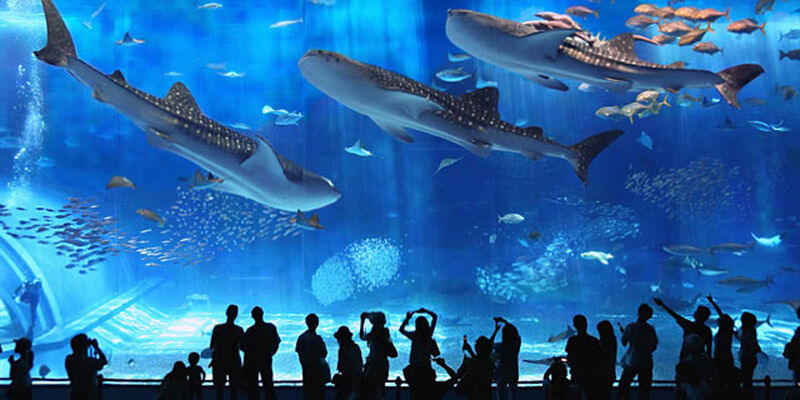 It is the second largest aquarium of the world and the biggest in Japan. 740 species are dwelling in 77 fish basins. Not only many fish, also corals and whale sharks live in the aquarium. 70 % of the animals are bred in-house, the remaining were captured. Next is a short visit of Okashi Goten, a store specialized in Okinawan sweets. 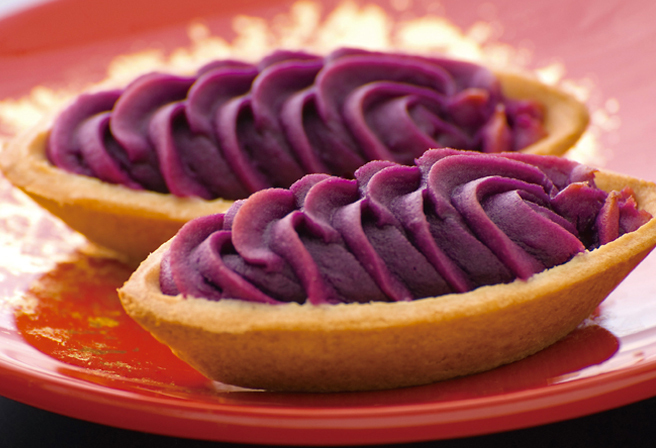 Especially the Beniimo tarts made from sweet potatoes are quite popular. These will be my omiyage from Okinawa I guess. Lastly, the tour visits Ryukyu mura, another theme park about traditional Okinawan culture realized as a recreated village from the times of the Ryukyu Kingdom (17th century). In the evening I will return to Naha and spend some time near Kokusai Dori again. I might also make use of the special duty-free shops located close by. Apart from all the fun things, I have something work related planned on the third day. I am currently majoring chemistry in Zurich and will finish my graduate degree next year, so I want to reach out to new possibilities and opportunities – both in research and industry. And of course, Japan plays its role in my considerations. In fact, there is a relatively new international research institute on the island! 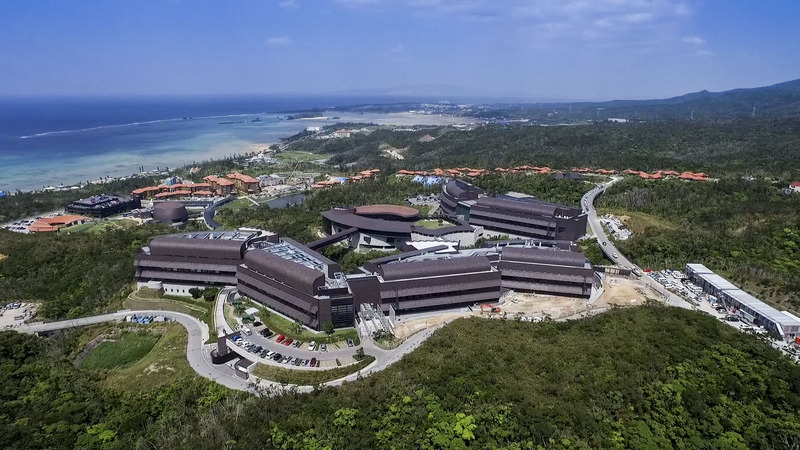 The Okinawa Institute of Science and Technology, shortened OIST, originally focused on marine biology, but expanded their research focus widely to include many disciplines, including chemistry. This a great opportunity to get a glimpse of the faculty and the campus. After taking part in a guided tour and exploring the campus I will catch a bus back to the airport. The next destination: Nagoya. Well, with detours. Unfortunately I was not able to book a flight directly to Nagoya, so I will fly to Osaka, instead. From there I will take the Shinkansen to Nagoya. Since I will use some long-distance trains after all, I decided to buy the Japan Rail Pass another time, which will be cost-efficient, even if I use it on a few days only. In the late evening I should arrive at my hotel close to the station.